These days, working from home is becoming an everyday reality for a growing number of people. One thing that’s very important when working from home is accountability. Your boss needs to be able to figure out what you’ve been spending your time on and what you’ve produced. Solutions for this problem span the gamut from complete trust (my favorite, when the boss and employee have worked together for a while) all the way to apps that take constant screenshots of your desktop and monitor your every move via the webcam (seriously, that’s what vWorker.com uses, and sometimes it’s necessary). [NO LONGER WORKS] Ididwork lies closer to the “trust” end of the spectrum. It lets employees report what they’ve done in short, tweet-like messages, and is very unobtrusive. Ididwork is almost like two apps in one: It’s cut cleanly down the middle, with a different interface for managers and employees. Couldn’t be simpler. 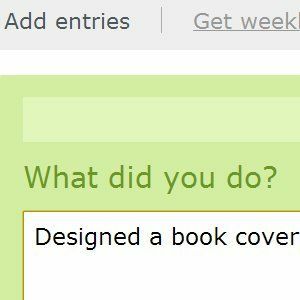 You get a large text field and can just type in what you did. Each status update can be up to (you guessed it) 160 characters long. This can either be a tiny task (“Finished first draft of one drawing”), if your boss likes to micro-manage. Or it can be something substantial, if you’re fortunate enough to have a hands-off type of manager. Some beautiful UI work there: See how ididwork allows advanced functionality (submitting via IM and using tags), but hides it using unobtrusive links. There’s very nice help text for all three properties (tags, time tracking and to-do tracking), and they’re quite simple. It really could not be simpler. The star isn’t all that clear, though: Why should you star a task you did yourself, and where will that star show up? I could find no explanation for this in the UI. It clearly shows what tags you’ve spent most of your time with, and this is one place where you can see your starred tasks. This is only an accurate gauge if all tasks you log are of a similar size. Otherwise, ten tiny marketing tasks would loom larger on the graph than one huge wildlife-related task that took much longer. The graph also lets you drill down into a single category and compare it to past weeks, so you can see how the nature of your work changes over time. That’s right: You can report your work via AIM, Yahoo! Messenger or Google Talk. I’ve tested this before, using Google Talk, and it worked very well. This is actually the handiest way to use ididwork: You just add it to your friends list, and ping it whenever you complete a task. No need to open a browser tab or log-in. Couldn’t be simpler, really. Ididwork is a lovely app that gets almost everything right. The UI strikes a fine balance between simplicity and power, and the overall concept is very compelling, both for managers and employees. Both telecommuting and cubicle-dwelling employees could make very good use of it.